The Amara 2 mm Glove is the Gold Standard for Warm Water Gloves! Its Amara Leather Palm provides a great degree of Hand Protection from Reefs, Wrecks, or Lobsters' Spines. 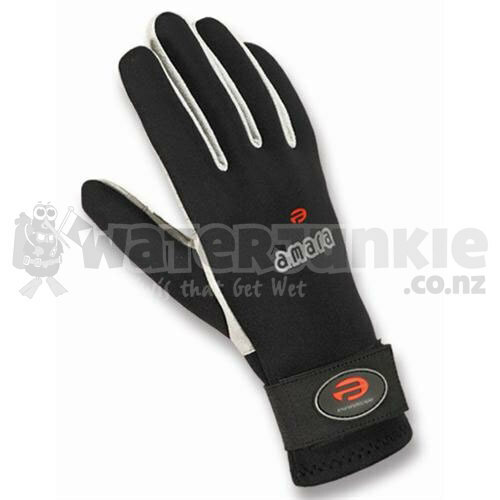 The Amara is also a great Spear Fishing Glove, and it is Light-Enough to use for Above-Water Sports like Water Skiing, Wind Surfing, etc. This 2 mm Titanium Lined Nylon ll Neoprene on the back of the Hand and the Amara Leather Palm and Finger Covering is Tough-and-Long-Lasting. Velcro Fastener Wrist Strap with Grip Tab to ensure Secure Fit, Minimize Water Transfer and provide Custom Feel. 2 mm Armara Gloves have Sewn Seams for Strength and Durability, are Black and Gray in color and come with a Multi-Purpose Mesh Carry Bag. Gloves are covered by a 12 month limited warranty. Gold Standard for Warm Water Gloves! Light-Enough for Above-Water Sports, Water Skiing, Wind Surfing, etc.